So, you’re at a stage in life where you can afford to spend a little more on a mid-sized sedan – something with a bit of prestige, but one that won’t necessarily blow the roof off the bank account. European, of course. But the Germans leave you feeling a little, well, clinical, while the Italians, well, they’re Italian aren’t they? Enter the Brits (okay, okay, the Indians). The 2018 Jaguar XE, the mid-sized four-door sedan from that oh-so-British marque defining, well, Britishness since 1935. Yes, it is Indian-owned now, but Jaguar, to many, is still associated with Dear Old Blighty and a stiff upper lip. But, with 11 variants in the model range, narrowing down the choice can be fraught with indecision. Not to mention a price spread of $32,200 between cheapest and most expensive variants in the range. Entry point for the XE range is the 20t Prestige petrol that will set you back $60,500 plus on-roads, while the top-spec 35t S petrol asks for $92,700. Nestled inconspicuously in that 11-variant range are two diesel options, the 20d Prestige ($62,900) and the 20d R-Sport ($64,400). And that brings up the often vexing question of petrol versus diesel. While oilers continue to sell in large numbers in the SUV and commercial segments (28,637 units sold so far in 2018 to end of April), diesel-powered passenger cars are still very much a minority with sales of just 1156 to end of April, compared with 25,360 petrol-engined cars finding new garages to call home. It could be argued that buyers of passenger cars are looking for comfort and refinement, traits not always associated with oilers. And then there’s the recent headline news stigma attached to diesel cars. But, if faced with the choice of essentially the same car, one petrol-driven, one diesel-engined, which should you opt for? Let’s – try – to find out. There’s little to separate this pair of brawling kittens. 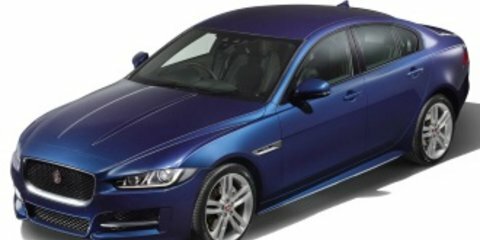 In the petrol corner, we have the 2018 Jaguar XE R-Sport 25t with a starting price of $66,500 before on-roads. That’s some $2100 more than its diesel counterpart, the 2018 Jaguar XE R-Sport 20d that gets underway at $64,400 (plus on-roads). They share, unsurprisingly, a remarkably similar list of standard inclusions. There are, of course, subtle differences, but sitting in the cabin of either proves a futile game of ‘pick the variant’. Simply, until you push the stop/start button, you can’t. The 10-way electrically adjustable sports seats are finished in a sporty-looking Luxtec and mesh finish with contrasting red stitching. There’s plenty of support too, with four-way electric lumbar adjustment. If I’m honest, the mesh is a bit cheap-looking and out of place in a Jaguar. There is an optional perforated leather package with contrast stitching that will set you back $2270, but neither car on test featured this. An R-Sport branded leather steering wheel comes standard and features electric adjustment, both tilt and reach. Finding the optimal driving position is a cinch. Cabin comfort and ambience come via two-zone climate control and rear seat passengers have their own vents. On the safety front, the XE R-Sport is pretty well stocked with active assists. Autonomous emergency braking, cruise control with speed limiter, blind spot monitoring with rear cross-traffic alert, park assist, and lane departure warning are all standard. The petrol XE was equipped with the optional Active Safety Pack ($2510) that adds adaptive cruise control, lane keeping assist, and driver fatigue monitor. An 8.0-inch touchscreen is standard in the XE, however, both our test cars featured optional infotainment systems. The petrol 25t scored Jaguar’s InControl Touch Pro Navigation Pack ($1710) that bumps up the touchscreen to 10 inches while adding a configurable 12.3-inch active driver’s display. The diesel 20d goes one step further with InControl Touch Pro Navigation with an 825W 17-speaker Meridian sound system that asks for $3790. Add to that a cheeky $580 if you want DAB+ radio that our tester featured. In typical Jaguar fashion, options abound in both cars. Externally, it’s difficult to distinguish the two, thanks to both cars sporting Jaguar’s Firenze Red paint (a $1370 option). Both sit on alloys, and visually this is where the biggest difference lies, with the 20d diesel sporting five-spoke 18-inch alloys with the unimaginative name ‘Style 5030’ as standard, while the 25t petrol scores 19-inch alloys, ‘Style 5031’, a $1270 option. Both feature Xenon headlights with LED daytime running lights, and both score a slightly sporty lower bodykit featuring side, front and rear skirts. The optional Black Pack ($750) adds a gloss-black grille with chrome surrounds and gloss-black side window surrounds. And yes, both the petrol and diesel feature this option. A sliding panoramic roof ($1890) adds a nice ambience to what are otherwise austere cabins, while heated front seats add $660 to both cars. In all, there is around $18,000 worth of options on the petrol, bringing the as-tested price to $84,650 plus on-road costs. The diesel isn’t isolated in this regard either, carrying a hefty $16,000 or so list of extras for an as-tested price of $80,600 plus on-roads. The biggest point of difference between these two is, of course, under the snouts of the respective XEs. Powering the R-Sport 25t is a 2.0-litre turbocharged petrol unit with outputs of 184kW (at 5500rpm) and 365Nm between 1200–4500rpm. Jaguar claims it can scoot from standstill to 100km/h in a brisk 6.3 seconds with a top speed of 250km/h. The R-Sport 20d also features a 2.0-litre turbocharged unit, albeit this one sips from a saucer of diesel. Unsurprisingly, its power output is a more modest 132kW coming on song at 4000rpm. But, the 20d makes up for it with a slab more torque, 430Nm between 1750–2500rpm. Jaguar says this cat can leap to 100km/h in 7.8 seconds with a top speed of 228km/h. Transmitting that power to the rear wheels is an eight-speed automatic transmission. Yep, in both. JaguarDrive Control comes standard in both the petrol and diesel R-Sport variants and offers Normal, Eco, Dynamic and Rain Ice Snow modes. Toggling between the different modes changes steering and throttle mapping, depending on the mode chosen, while selecting Rain Ice Snow removes some enthusiasm from the throttle and modulates traction. The XE does come with adaptive dampers and dynamics, but it’s a $1210 option and only the 25t R-Sport had this box ticked. It allows for a level of customisation – and personalisation – across engine mapping, steering, suspension and gear changes. It would be nice to think the difficulty in telling this pair apart by its visual cues would translate to under the bonnet. Sadly, that’s not the case. The 20d errs on the side of agricultural, and certainly in the way it sounds. This is no refined application of diesel tech. Instead, it clatters and rumbles along, leaving you in no doubt there’s an oiler lurking beneath. That’s not to say it doesn’t drive okay. It does, but with the caveat you need to be on the move to get the best out of the diesel. Around town, in stop-start traffic, the XE 20d is a noisy and, I’ll be honest, tiresome beast. There’s a lurching quality to the ZF-sourced transmission, particularly lower on the speed spectrum. Take-off can be either abrupt or laggy, depending on throttle input. It’s difficult to find the balance, the torque curve kicking in at 1750rpm. Too much throttle and she leaps away from standstill with an unpredictability that’s hard to get used to. Not enough throttle, and the 20d lumbers away hunting for more Newton Metres that just aren’t there to be found. It’s an exasperating drive experience. Once on the move, though, on the open road, the XE 20d is happy to motor along in a relatively refined manner. There’s no bullet-like surge of speed, but she sits nicely on 110km/h as you quickly forget about the juddering and stuttering around-town experience. This really is the 20d’s sweet spot – cruising on the open road with not too many questions asked of it. Fuel consumption drops nicely too, mid-fives per 100 clicks, in stark contrast to city duties where a rather more voracious figure of 8.4L/100km was registered. Jaguar claims 4.2L/100km on the combined cycle and 5.1L/100km in the city. Not close, then. Stepping into the R-Sport 25t petrol variant provided a mild improvement in performance. There’s more surge to be had, and it’s altogether more linear. Obviously, having more kilowatts to play with helps in this regard, as does having its (lower) torque available from just 1200rpm. Take-off from standstill is way more predictable and smoother. Of course, she’s no sports sedan, despite a pretty brisk 6.3s to 100km/h claim that feels, to be honest, pretty optimistic to this reviewer. Of course, with no diesel clatter to contend with, the drive around town is on a different level of refinement compared with its diesel sibling. Quieter, smoother, and altogether more enjoyable. This is what a Jaguar should be. Out on the highway, the 25t does exactly what its namesake suggests – it purrs along with a refinement and contentment that devours clicks with ease. There’s no lack of willingness from the slightly sporty 2.0-litre turbo, although if it’s theatre you are after, with its commensurate roartiness, then look elsewhere in the XE line-up. There is still some hesitation from the eight-speed auto, which never really feels up to the task of hustling the Jaguar, especially in traffic and around town. Jaguar needs a pat on the back, or in cat talk a stroke under the chin, for its generous ownership experience. Covered by the brand’s three-year/100,00km warranty is, let’s face it, lacklustre. But, the Big Cat makes up for it with a more than generous capped-price (and pre-paid) servicing plan. Just $1500 will get you five years and 130,000km of servicing. Yep, that’s $300 a year. For a Euro luxo barge. Service intervals are every 12 months or 12,000km, whichever occurs first. The diesel cat is slightly less generous. Still at $1500, Jaguar’s plan covers the first five years of servicing, but with a lower kilometre cap at 102,000km. Interestingly, though, this doesn’t represent quite the same value for money as the petrol version, with service intervals of 24 months and every 36,000km. Fuel consumption has already been covered, with neither variant coming close to reaching their respective manufacturer claims. Interestingly, the 20d sports a slightly smaller fuel tank at 56 litres (against the petrol’s 63-litre tank). Using our week with both cars as an example of real-world driving, a mix of highway and urban snarl, we registered 8.4L/100km in the diesel and 10.4L/100km in the 25t petrol cat. It should be noted, we replicated our drive loops exactly in both cars to try and arrive at realistic, if not scientific, figures. That said, with its 56-litre capacity, the diesel will net you around 666km of typical motoring between refills. The 25t will need slightly more frequent trips to the servo with a 605km range between refills. Based on those figures and on the average price of fuel in Australia for the week ending 13 May, 2018 (source: Australian Institute of Petroleum), the diesel will set you back $82.88 per refill ($1.48 per litre), while the petrol will need you to tap your credit card for $91.98 ($1.46/litre). A saving of $9.10 at the pump per refill for the diesel Jag. Hardly compelling stuff. Mind you, over a year and assuming a weekly commute of 300km, the petrol will need refilling, on average, every two weeks, while its diesel brother can stretch out an extra two days per filling, amounting to almost three less tanks of fuel per year, or a saving of approximately $450 annually on fuel costs alone. Factor in the $2100 cheaper starting price for the 20d, and it’s easy to see why people could opt for an oiler. It’s tempting, if you’re after Euro luxury but the purse strings are on the tight side, to pick the XE diesel over the petrol. The savings on the sticker price compared to a similarly specced petrol variant, combined with the extra change in your pocket at the bowser, makes a compelling case. But, when you’re playing in this segment, a certain level of refinement is not only needed, but expected. And in that regard, the XE 25t R-Sport delivers handsomely over the XE 20d R-Sport. It’s simply faster, sportier, quieter and more engaging behind the wheel. That makes it a winner in our eyes.